A 5-year-old went out on Alaska waters with his grandfather. They planned to spend the day fishing together in southwest Alaska. Before boarding the boat, the grandfather borrowed a life jacket for his grandson. They were a couple of miles away from shore when their boat capsized. The grandfather was able to grab ahold of the boy, and the boy’s life jacket kept him afloat until they were rescued. This is just one reported save that was shared with Alaska’s Kids Don’t Float program office. 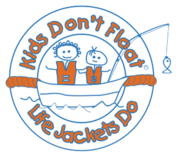 As of January 2018, 32 children have survived a near fatality due to a Kids Don’t Float life jacket. June is National Safety Month. A critical way to stay safe is to wear life jackets when you are on or near water. 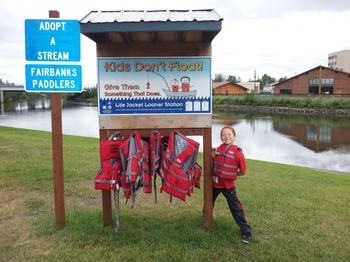 The Kids Don’t Float Program — Life Jacket Loaner Boards are located throughout Alaska. Anyone, kids or adults, can borrow a life jacket when boating or enjoying other water-related recreational activities. Drownings remain a serious concern in Alaska. From 2014 to 2016, 91 Alaskans drowned. Ten of them were children under the age of 13. The Kids Don’t Float loaner boards provide thousands of life jackets to prevent drownings like these. The program has distributed more than 50,000 life jackets throughout the state since the beginning of the program in 1996. Alaska Statute requires children to wear life jackets: Children under 13 years old must wear a U.S. Coast Guard-approved life jacket when in an open boat, on an open deck, or when waterskiing. The state law only applies to children, but the U.S. Coast Guard and Alaska Office of Boating Safety recommend that everyone of all ages wear a life jacket when aboard a boat. Wearing a life jacket can potentially save your life and helps you set an example for others about safe water recreation. When choosing and using a life jacket, pick a jacket that you will wear and that fits. Make sure to read the label for type and proper size, and ensure that it is approved by the U.S. Coast Guard. Be sure the life jacket is in good condition. Look for signs of rips and tears and check that all straps, buckles, and zippers work. If you fall into cold water, hypothermia can set in and drop your core temperature below 95 degrees Fahrenheit. This can lead to shock, difficulty breathing, and flailing in the water without control. If you are not wearing a life jacket, you may be unable to keep your head above water to breathe. If you are heading out on the water and you don’t have a life jacket, be sure to look for a Kids Don’t Float loaner board in your community and borrow one. This year, there will be more than 600 life jacket loaner board sites participating throughout the state. Community members, private organizations, safety agencies and advocates voluntarily manage these loaner boards. If you are not sure if there is a board in the community where you live or where you plan to visit, go online or call (907) 465-4170. Alaska Department of Health and Social Services. Division of Public Health. 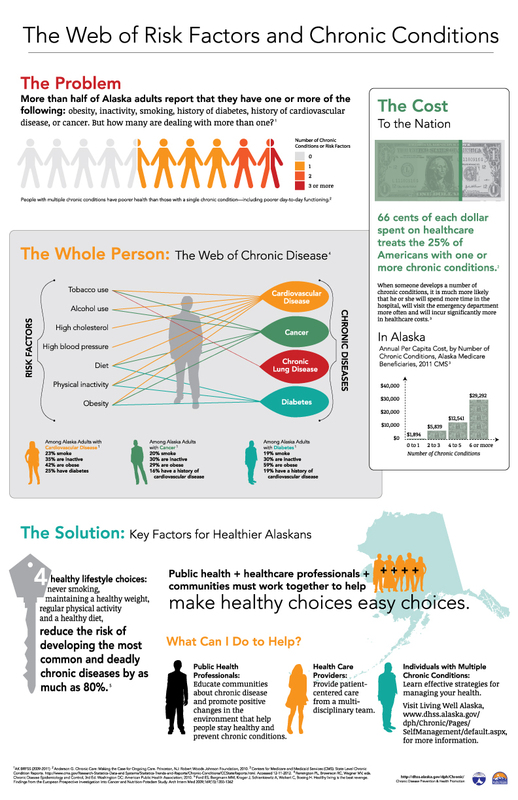 Section of Chronic Disease Prevention and Health Promotion. Kids Don’t Float Loaner Database. Accessed May 2018. Alaska Department of Health and Social Services. Division of Public Health. Section of Health Analytics and Vital Records. Accessed April 2018. Alaska Department of Natural Resources. Division of Parks and Outdoor Recreation, Office of Boating Safety. Alaska Boater's Handbook 2014. Accessed May 2018. Alaska Department of Health and Social Services. Division of Public Health. Section of Emergency Programs, Emergency Medical Services Program. State of Alaska Cold Injuries Guidelines 2014. Accessed May 2018.